Bone Builders is an exercise and prevention program developed by scientists and exercise specialists is designed to help build bone density and strength through weight-bearing repetition at a very slow pace. The movements are focused to improve balance and strength, which are critical factors in reducing the risk for osteoporotic fractures. Trained RSVP & OWLS Volunteers will lead the class in a fun and welcoming atmosphere for all ages and abilities (with approval from participant’s physicians.) Socializing is an added benefit. Come give it a try! 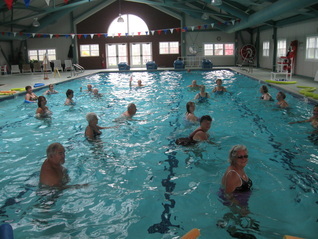 Tuesdays, Wednesdays, and Fridays 8:00 am to 11:00 am. For more information and/or to sign up, please call us at:(603) 237-4019.